* Best seasons and averages included. PG Jevon Carter (2018) – 17.3 PPG, 6.6 APG, 4.6 RPG, 3.0 SPG – Career steal leader (330), single-season steal leader (112), single-season assist leader (246), 4-time Big 12 All Defensive Team. G/F Rod “Hot Rod” Hundley (1956) – 26.6 PPG, 13.1 RPG, 3.4 APG – “Hot Rod” is 2nd all-time in points scored (2,180) and owns the record for single-game points for WVU with 54. 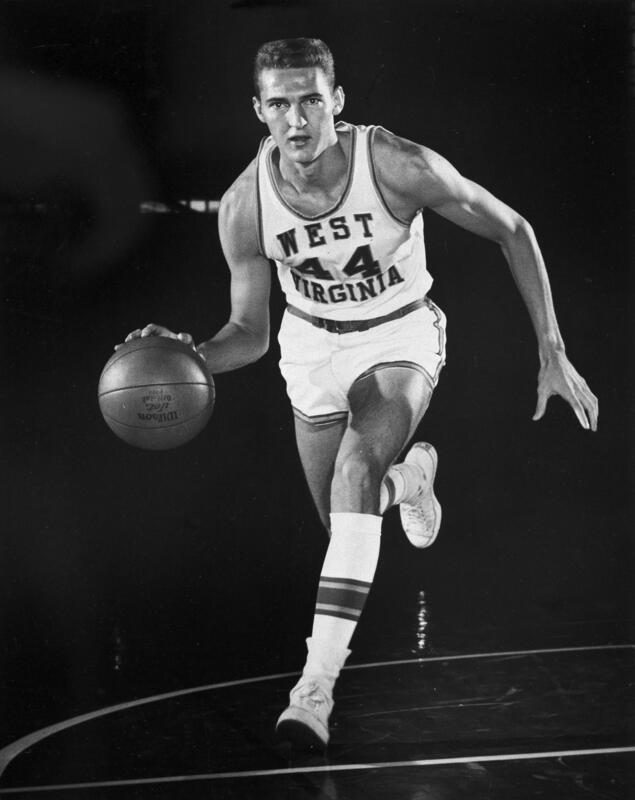 F Jerry West (1960) – 29.3 PPG, 16.5 RPG, 4.3 APG – The greatest basketball player in WVU history. Career leader in points with 2,309 (and accomplished without a 3 point line). Also, the all-time WVU leader in field goals made and most 20 point and 30 point games. F Kevin Jones (2012) – 19.9 PPG, 10.9 RPG, 1.2 APG – Led 2010 team to the Final Four, most offensive rebounds in a season with 141, 1,822 points which is 5th all-time in WVU history. C Mark Workman (1952) – 23.1 PPG, 17.5 RPG, 1.3 APG – 1,553 career points, single-game record of field goals made with 22, 5th all-time with career scoring average (20.4 PPG). G/F Rod Thorn (1962) – 23.7 PPG, 12.1 RPG, 4.1 APG – 7th all-time in scoring (1,785 points), 11th all-time in assists (304) and 7th all-time in rebounds with 912. G Will Robinson (1972) – 29.4 PPG, 2.5 APG, 4.0 RPG – A third-team All-American in 1972, Robinson averaged an all-time season high in points per game with 29.4. F Kevin Pittsnogle (2006) – 19.3 PPG, 5.5 RPG, 1.2 APG – 2nd most 3PT field goals made in WVU history, 2nd all-time 3PT percentage (41.1%), 8th all-time in scoring with 1,708 points. G Greg Jones (1983) – 22.3 PPG, 4.1 APG, 3.5 RPG – 6th all-time in career scoring (1,797), 10th all-time in FGs made, 7th all-time in career assists (122). Questions for debate: Who is missing? Who doesn’t belong? Would this all-time WVU team beat Duke’s current team? Did Logan Routt Trip Matt Mooney on Purpose?